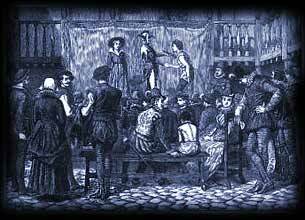 In the Elizabethan era the young members of the choirs were also encouraged to participate in drama. In 1575, Sebastian Westcott was running a well-established, small private theatre within the precinct of St. Paul's. It was well attended and financially successful as it was backed by wealthy patronage. It specialised in presenting entertainments for royal and noble households. Queen Elizabeth I loved the entertainments provided by the young children of these chorister groups which added to the extraordinary popularity of the child acting companies of the fifteenth and sixteenth century. Paul's were renowned for their sumptuous costumes, their props and the quality of the entertainments provided for them by a long succession of writers. The young acting troupe was referred to as "Paul's Pigeons". Paul's was destroyed in the Great Fire of 1666 but its site is marked by a plaque. Our thanks go to Alan Burkitt-Gray for clarifying the confusion regarding the 'Actor's Church' the name which we erroneously attributed to St Pauls. The 'Actors Church' in fact relates to The Parish Church of Covent Garden which was built in 1633 by Inigo Jones. The term 'Actors Church ' derives from the long association that the Parish Church of Covent Garden has had with the Acting Community.